With this latest set of storms replenishing California’s snowpack and water levels in reservoirs, rivers and streams, it may be hard to think about water conservation issues. But this is a still a semi-arid state, so it is always prudent to prepare for droughts. So where can we save the most water? Farming in California depends on irrigation, so agriculture seems the largest potential source for cost-effective water savings in the state. Although agriculture’s share has been declining, it still accounts for roughly 75 percent of all human water use, compared to 25 percent for urban uses. The recent book, Managing California’s Water: From Conflict to Reconciliation, examines agricultural water conservation extensively and points out the complexity of this issue. The book’s findings are based on scientific and economic research and field experience in California and worldwide. 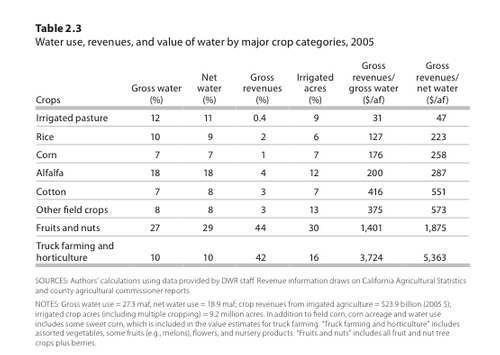 Much agricultural water is still devoted to relatively low-value crops: In 2005, over 60 percent of “net” water use in the agricultural sector – the amount consumed by crops – was for irrigation of pasture and field crops such as alfalfa, corn, rice, and cotton, which generated only 14 percent of crop revenues. These statistics imply significant potential for reducing farm water use without incurring overwhelming consequences for the state’s economy. Contrary to popular understanding, however, improving on-farm irrigation efficiency is usually a poor way to achieve real agricultural water savings. Real conservation usually requires shifting to crops that use less water or reducing crop production, such as by fallowing farmland. This is because much of the irrigation water applied when farmers use “inefficient” techniques like furrow irrigation is returned to streams or aquifers, where it becomes available for reuse. This is the international scientific consensus on irrigation conservation, from studies worldwide. Most groundwater recharge in California’s Central Valley is from irrigation runoff and percolation. This recharge helps to replenish depleted aquifers and serves as a significant source of supply during drought. Only a few areas in California, such as the Imperial Valley, can save large amounts of water by adopting more efficient irrigation techniques. In such areas, the excess irrigation water flows into saline water bodies or contaminated aquifers, where it is unavailable for reuse, so reducing runoff generates real water savings. Even though improving irrigation efficiency usually does not produce significant real water savings, it can provide economic benefits for farmers. Farmers usually pay for the amount of water they apply to their fields, not the amount consumed by crops. When farmers face limited supplies, they often have an incentive to adopt more efficient techniques, such as drip irrigation, to make use of every possible drop on their farms. These techniques, often combined with laser leveling of fields and more precise doses of fertilizers and pesticides, can improve crop productivity and quality. 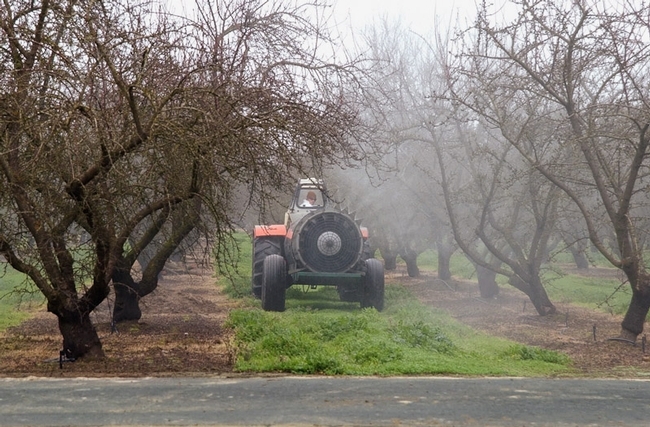 In recent decades, many San Joaquin Valley farmers have made such changes, which have enabled them to plant greater acreages of higher-value fruit, nut and vegetable crops. 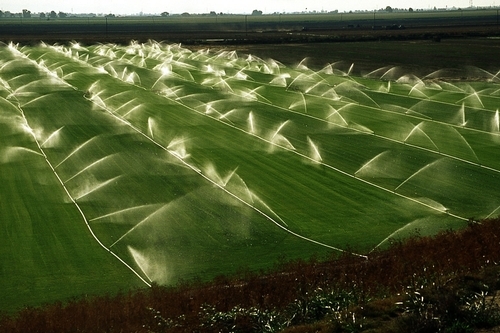 Improving irrigation efficiency also can provide environmental benefits. For instance, agricultural runoff sometimes contains harmful salts and other chemicals, and more efficient irrigation can help reduce these discharges. This is another reason for the rise in more efficient irrigation techniques on the west side of the San Joaquin Valley, where farmers are required to limit runoff of selenium, a toxin to wildlife. Similarly, by reducing diversions, irrigation efficiency may allow higher streamflows on particular stretches of rivers, improving conditions for aquatic life. Although counterintuitive, more efficient irrigation techniques also can increase water consumption. By allowing farmers to farm their fields more intensively and to expand irrigated acreage with the water they “save,” techniques like drip irrigation can increase net farm water use within a region, thereby reducing groundwater recharge and nearby streamflow. Conservation-oriented policies that neglect this possibility can exacerbate groundwater overdraft, as studies from New Mexico to Yemen have shown. What is the right policy to encourage effective agricultural water conservation? It depends on the objective. 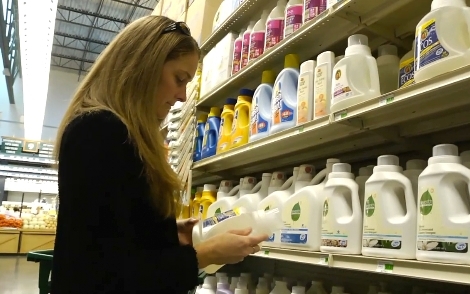 To encourage real water savings, the best policy is to let market forces work. Water markets are a flexible and efficient way to encourage farmers to create real water savings for higher-valued uses. California needs to improve the ability to buy and sell water, by reducing state and local barriers, to give farmers better price signals. To reduce polluted agricultural runoff or improve streamflows in some areas, the best policy is to adopt regulations that directly address pollution discharges and instream flows, and allow farmers to choose the most cost-effective way to meet these requirements. In contrast, policies that impose particular irrigation technologies, or even ban specific crops, are likely to impose higher costs on farmers and society, while failing to save real water. Given the immense variety and variability of conditions in California, rigid regulatory policies to promote agricultural water conservation seem more likely to create more controversy and increased social cost than usable water savings. Agricultural water conservation is an important part of California’s water future. But simplistic notions of water conservation threaten to mislead California’s water policy debates by presenting the false claim that water saved from on-farm use is necessarily water saved to the system. 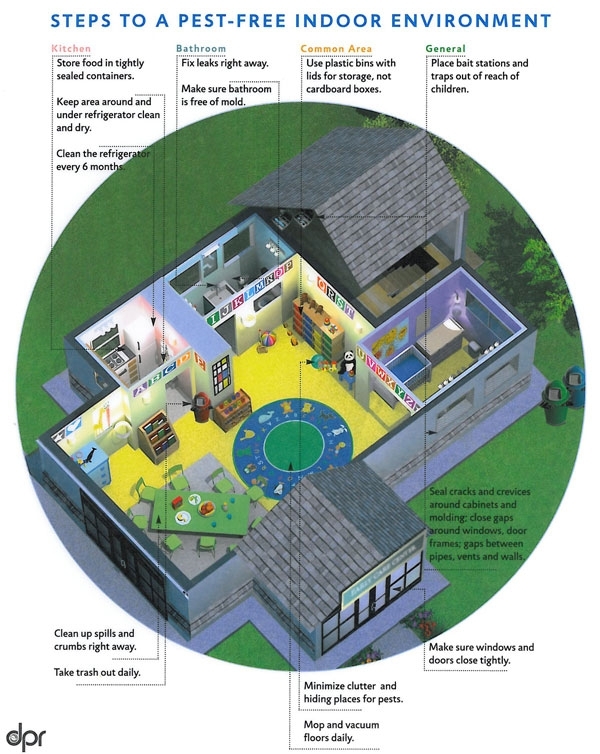 It is time to take water conservation seriously. In doing so, we also must undertake water conservation scientifically, rather than rhetorically. If you are passionate about a forest near you then you may want to tune into the UC Cooperative Extension webinar series on Community Forests. The webinars will begin at 6:30 p.m. Pacific Standard Time on April 7 with additional programs on April 13, 20 and 27. Participants may also want to take part in related field trips to Arcata Community Forest, Usal Redwood Forest, Tahoe-Donner and Weaverville Community Forest. Community forests are forested lands that are managed to produce what people value. Forests may be valued as a source of timber for lumber, clean water, wildlife habitat, recreational purposes or for all of these benefits in combination. 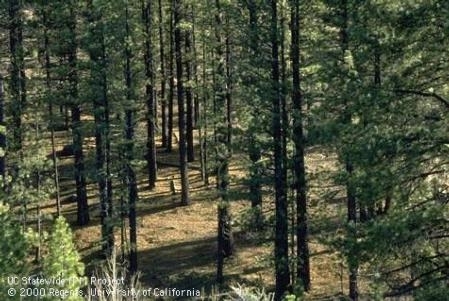 The webinar series aims to present an overview of community forestry as it is currently being practiced in California. The intended audience is natural resource managers, environmental and forest activist groups, residents of forested regions who might benefit from a community forest approach in their areas and the general public concerned with forest management. This program is a collaborative effort of the University of California Cooperative Extension and the Northern California Society of American Foresters, with funding support from the USDA Forest Service and the University of California. Additional information and a link to registration are available at http://ucanr.org/community_forests. UC collaborators on the project are natural resources advisors Mike De Lasaux, Susie Kocher, Gary Nakamura and contractor Richard Harris. A webinar series and field trips will educate the public on community forests.